Yes, the infamous Motherchucker, Chuck Bass is gracing our television screens once more. Hopefully, you saw the season two premiere of 'Gossip Girl' last night. Right on cue, our bad boy began where he left off last time around. Scheming, plotting, tormenting Blair. The angst-filled lusty dance between Blair and Chuck promises to be such a delicious tease for the foreseeable future, I feel like I'm going to combust waiting for some sort of delirious resolution! New this season, was that a heart that I spotted? Does Chuck have *real* feelings? 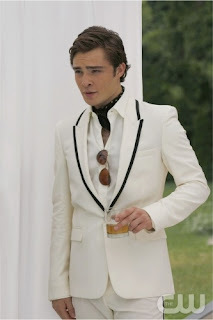 Stay tuned...perhaps Chuck Bass-tard will learn to deliver those 8 little letters sooner rather than later!